Thin margins keep the emphasis on inputs and proven capital investment strategies. Wisconsin growers Rick and Carla Hargrave have taken several steps to stay in business in today's tight-margin environment. These corn growers only invest money toward inputs and capital that are proven return on investment (ROI). "For example, we will not be upgrading machinery this year," Rick explains. "Inputs have to show a return in yield that is 1Â½ times the cost." Additionally, over the years, this husband and wife team have worked a lot with nitrogen management to find the sweet spot for maximum economic yield. Soil type and irrigation determine the rate of nitrogen application. "We split apply all nitrogen applications for better utilization and risk management," Rick says. "Dryland is split over three applications, and irrigated land is six applications." "For better fertilizer utilization, we are strong believers in putting the nutrients into the root zone. We prefer to have it banded near the seed," he continues. "We set up our 16-row Kinze planter for dry fertilizer placement at 2 x 2. Yes, it does take more time planting corn, but we have seen plant health advantages with potash banded near the plant. The plant is able to grab and utilize the nutrients. Another benefit is we save 17 cents per unit pound of phosphorus using dry fertilizer versus 10-34-0. Applying 46 units of P through DAP, we save $7.82 per acre versus using 10-34-0." This year, the Hargraves, who farm about 600 acres of pivot-irrigated corn and 400 acres of dryland corn, plan to fine-tune their fertilizer placement even more. On their 16-row sidedress unit, they are going to replace coulters with Y-drops on three of the rows to get fertilizer closer to the root zone for better utilization. These Wisconsin corn growers are also using more technology to become more efficient and productive. They use Climate FieldView to collect data and analyze their fields. "We use it to evaluate hybrids, troubleshoot areas of a field and evaluate our highest yielding sections," Rick says. "The tool is very helpful in circling a spot in the field and seeing the average yield, moisture and soil type for that specific area. It helps us analyze our production practices for maximum return on all our acres." The farm economy in the Hargraves' farm area, near Berlin, Wisconsin, is doing well. Land sales are holding, and the state's dairy industry keeps land values up. "The dairies need land for feed and manure applications," Rick says. "However, land rents have softened, and the market is weeding out the mediocre managers from the good ones." Partnering up with a local dairy helps keep the Hargraves' operation successful. "We work with a local dairy by growing alfalfa for them and by purchasing manure for fertilizer from them," Rick says. "We target manure applications on our lowest soil-testing fields for phosphorus. And our irrigated alfalfa yields 6.5 to 7 tons dry matter per acre per year. Because of the high tonnage, it is a profitable alternative for us." Their BASF Innovation Specialist helps them keep up with products and agronomy. 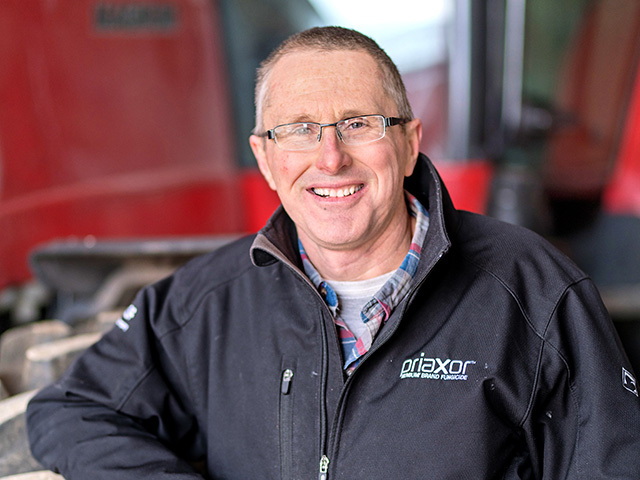 "With Wade Oehmichen's knowledge of products, nutrients and plant physiology, we have been able to effectively make better decisions in managing our crops in this tight margin environment," Rick says. "A very fitting parable for farmers in these times is the parable in the Bible, Mark 4, of the sower who sowed his seed in good ground and took care of it."